A journal by any other word would be as true. Or would it? What if you called it a blog? Blogging is odd. When I first started, I had no idea what it was about. I wrote and wrote and wrote. The only person who read my posts was Mack, the guy I was seeing at the time. I was a bit censored. More than a bit, I guess. I was writing for an audience of one. And I was hardly honest about what I really felt. In fact, I’ve got a rant called How I Really Feel saved in my drafts. If the posts about my mother made you uncomfortable, this one would really raise an eyebrow. So I blogged to Mack. It was like an on-line journal. But a journal I knew he’d snoop into and read. He was still reading it in October, when my dad died. But somewhere along the way, after I broke it off, I stopped censoring. And I wrote to myself. I didn’t read other blogs. I wasn’t really sure how to find them. I didn’t use tags or categories or widgets. I didn’t know what they were. Until one day, I got curious about categories and tags. I read a WP help page about what they were. I still didn’t get the point, but I began tagging my posts. And then it happened. I got a like. And a follow. And a comment. By total strangers. How had they found my blog? I’m kind of smart, and so it occurred to me, it must have been a tag or a category. So I kept tagging and categorizing. Then I found the topic search page, typed in “gaslighting,” and there was my post. So that’s how they found me. I began to read other posts, and follow other writers. (There is an incredible amount of talent out there.) I watched my follows increase. My little bar on my stats slowly went up and up. The day my brother died, last April, I had the most hits ever. It held the top spot for months. I wasn’t sure how I felt about that. It got more difficult as more people followed. I worried about conveying things poorly, sounding cold, or crazy, or mean, or wimpy. Or worst of all, broken. I was more careful. I attempted to lighten things up on occasion. 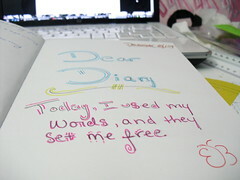 To stop treating my blog like a private diary. I started trying to entertain. Or if not to entertain, to just take it a little easy. I don’t want to take it easy. I want to write whatever I need to write. No matter if I sound crazy or mean or selfish or angry. Or broken. I might lose readers. People might grow weary. Or they might feel resonance and secretly nod their heads. Either way, my goal is to let whatever thing rolling around in my head that needs out, out. Another thing I’ve learned by blogging: there are so many kind, nonjudgmental, crazy-normal people in the blogosphere. I’m just amazed at the commonalities and the kind support. I wish I’d found this world years ago, when I was a teen. But then it didn’t exist. All I had to keep me grounded then was my paper journal. I’ve got a box full of them in the spare closet. Filled with years and years of uncensored writing. Now there’s some crazy for you: teenage angst. And depression. Through my 20s. Packed up in one big box. Keeping me anchored and steady. Be it a journal, or a blog. This entry was posted in Blogging, Death of a sibling, Gaslighting, Wine, Writing and tagged Blog, Blogging, Breaking Up, Death of a sibling, Depression, Gaslighting, Journal, Journaling, mental-health, Writers Resources, Writing. Bookmark the permalink. 19 Responses to What’s In A Name? This is exactly what I needed to read. I am at that sort of place now myself. I started my blog for no reason other than to live out my recovery geekiness. i could nerd out and express what it is I needed to express without worrying about prying eyes. Now, a few months later, I have the odd person or two reading my blog. So like you discuss here – now what? My posts tend to be a bit serious in tone, or a little spiritual in tone, a little composed rather than stream of conscious…and now that I have discovered so many wonderful recovery bloggers (like yourself) I am questioning things. I see lighter, humorous blogs that I love. I see very raw and emotional blogs that I too love. Then there are the polished writers, the from-left-field guys, the powerhouse go-get-em blogs, the gentle but firm mother hens, the philosophers, the long timers…and it goes on. So I start to think “do I need to be more like X, or should I lighten things up like Y or should I do some research into things like Z?” Gahhh! I guess the greater question is – what are my motives? You’re braver than me in just being you no matter what. Regardless of what is happening, your heart is stamped all over it. And that’s something I admire. I really do. I, like many others, probably have to navigate through this on my own and figure out what it is I am trying to do. Motives…again. You are so welcome, Paul. And thank you for your thoughts. I have had exactly the same experience. I feel myself being pulled this way and that. Again, there is so much good writing out there! Being true to myself is easier said than done. But it is my ultimate goal, and I intend to do my best to steer a steady course. It’s also occurred to me that if I desire to take a different tack (it seems I’m into sailing metaphors today), I can start a new blog. What’s better than a blog? Two blogs! I’m going to be bossy again. You write for you! What you had for breakfast? Go for it! Mating habits of those green lizards that the cats drag in? Whatever! The people who matter to your journey will stick around. The rest, eh, they just crowd the blog with unwanted comments about lizards creeping them out. Seriously, I’m not usually this bossy. I have to tell you to write whatever you want…because I tell myself to write whatever I want. Therefore, it must be ok! Personally, I like lizards. When I used to have outdooor kitties and they’d be waiting to get in with a green tail hanging from their mouths (usually wiggling), I felt bad for the little thing. Sometimes I wouldn’t know the kitty had a lizard until he opened his mouth and let it out, playing with it in my apartment. I’d catch the ill-fated little critters and put them back outside, hoping they’d make it after the mauling. Maybe I should do a post about things the cat dragged in. I can related to much of what you have said here. My reason for blogging was only to counter lies about and hate to myself and family by a mentally unstable sib (placed into adoption) who wrote a libelous book (got the book pulled). Most of my blog and other birthsibs’ blogs are in self-defense and putting truth to lies. Ours are not easy reading for we are angry. I have always had mixed feelings about discussing so much details of our personal family lives ‘out there’ but…our personal family honor was violated by this adoptee, who did much damage to us over the years and then wrote more lies in a BOOK and she still fights our side of things, 3 years after the book was written/pulled. Our very existence is a threat to her. But I have also found other bloggers that I can relate to on OTHER levels and that has opened me up to more and more intelligence realness instead of the garbage that I’ve had to counter; for that I can only say thank you for being yourselves and showing me YOUR lives. It’s interesting the varied experiences that inspire us to blog. And that many of us had no idea we’d form such meaningful connections by doing so. I have enjoyed the transformation from writing to an audience of one, to writing with a tribe of beautiful souls. When I first started my blog (almost 4 years ago), like you I had no idea what it was about. I had heard about other people doing it and thought it sounded “cool” so I decided to start one of my own. I had always wondered about “writing” as a hobby, so I thought it might be a good intro. Additionally, since I’m a bit of an introvert, I thought it might be a good way to let out some of what I was thinking and feeling once in a while. I blogged very sporadically for a couple of years, with only the occasional visitor. I finally started blogging on a more regular basis recently, and have now even picked up a few followers. My posts have started to started to garner “likes” from people who somehow run across my blog (like you, I must be learning how to use those tags and categories correctly now, though I might get even more “hits” if I used more of them). I read a blog recently where the author stated that they had just started the blog in January of this year and already had 1000 followers. Looking at one of their recent posts, there are easily 50 “likes” at the bottom of the post. Apparently some people are more successful at this than others. Personally, I have a lot more inside me that’s begging to get out and be set free onto this virtual paper, but daily life always seems to get in the way. Maybe I’ll have (make?) more time to blog after I reach my fitness goals and complete the planning for my upcoming trip. Whatever the case, I suppose that how successful your blog ultimately becomes depends on what your goals are. Do you want a blog with hundreds (thousands?) of followers? If so, you may have to adjust your writing style and post on a regular basis about things that don’t necessarily matter to you, but that catch the eyes of the masses. However, if your goal is to use this as an outlet to post what’s on your mind and in your heart, even if it’s dark and angry at times, you may not have the 1000’s of followers but what you write will be true and heartfelt. I, for one, will choose the “real” and heartfelt over the mindless “fluff” written for the masses anytime. Time is certainly an issue. I’m finding myself spending more and more time blogging, and less time on other tasks. I rarely turn on the television these days. I’m also behind on laundry. Exercise, moving my body, is not taking a back seat, however. I find it’s a good time to think and often write a post in my head before I sit down at the keyboard. Multi-tasking has become a necessity. I often sit on my front step with my iPad and a can of tuna, waiting for Sophie and catching up on your blogs. My goal was never to have thousands of followers, but I have to admit, once people started following, I liked it. That people can relate makes me feel a little less broken. A little less isolated. I never talked much to people about my family. It’s liberating to shine a light on it. In a journal, it was my own little private flashlight. Here, it’s a spotlight for all the world to see. Yes, I agree with you, real is the thing. I was just writing about the same thing! We take a daring leap when we put our feelings out into the public realm. Our blogs are our own, to express that which we need to, but it’s different than a journal because there is an audience, be it one or two like-minded people, or hundreds, you can’t help but start to think a little bit more about what you write. I actually think it’s good. In a journal, I would probably blather on and on in self-pity (which is what I did in my younger years, as well), but in my blog, well, I want to see some “progress”…and by sharing it, I feel more accountable for my own progress. And I love reading others’ blogs where I feel that deeper truths are being shared, as difficult and deeply personal as they might be. It gives us all connection, it helps us all to be courageous, vulnerable, and to seek deeper truths. Beautifully said! And you’ve touched on something that I hadn’t quite put my finger on. Progress. That’s been troubling me. I want people to know my days are not filled with the angst I purge in my writing. Although they might be if I didn’t write. It’s a release. But short of saying, “Hey, I’m making great progress, here!” how do I show progress? How do I inspire hope, and not be a big fat downer? Maybe it will naturally become evident in my writing. I see it n yours. The humor is a big clue. Thanks for sharing so openly……we all need this! Thank you for saying so. It helps knowing you do. Wow! You have started such a great conversation. I have often thought about many of the same issues. I recently came to the conclusion that I have to be clear about the goals for my blog. I also recently discovered that my blog has become the linchpin for my sobriety and sanity. Before I cry or think about drinking in reaction to bad news I blog about it. After a tough meeting with my boss I hid in my office and started the blog post about the situation. For this reason I have decided that I cannot worry as much about having my blog turned into a movie (imagine that) like that Julie cooking girl. Even if no one reads I will blog. I will read other blogs. For me, more so than any AA meeting I can attend, being a part of the blogosphere is essential to my recovery. Even my husband understands this. I think it’s funny that recently, instead of asking me if I have attended any meetings he asks, “Have you blogged today?” What a cheap form of therapy! P.S. I wonder if all bloggers have boxes of diaries. I certainly do! I have tried to throw them out several times. I just can’t part with them. I also don’t like reading them too much. My issues around reading my own diaries are definitely a topic for a blog post! You’re exactly right: it is therapy. Group therapy! It’s helped so much in getting me through this past year. I thought I was the only person in the world whose father and brother died within six months of each other, the only person who sat with someone in hospice as he took his last breath, the only one whose family was ravaged by the pain of alcoholism x3, The only one whose mother turned out to be a disappointment, when I let myself actually look at her. I’ve often felt like someone looking into the windows of houses filled with families enjoying each others’ company, and feeling like an outsider. Wanting what they have. Now I know there are lots of us peering in those windows. I’m not so alone out here after all. PS–I’ve tried and have been unsuccessful in getting rid of my journals. I don’t read them, either. Although I might if I ever decide to write that memoir. Wonderfully put & so true, on so many levels, for me as well. I am also at a “cross roads” of what to share & how to convey my message on the blog. When I started blogging, I too just started writing to keep my sisters and a couple of friends updated as I headed to Saudi Arabia. But now I’ve got followers and I feel responsibility … and some pressure … sometimes I feel the pull to just go back to paper & pen.